With 2018 coming to a close, and a new year on the horizon, it’s hard to believe all that has happened in the last 365 days. An Olympics was held, a royal wedding took place, and while the world was watching those global celebrations, it held its breath in November while waiting for the results of the most important political movement in the last two years: the midterm elections. For many voters, the 2018 midterm elections were the first time since Trump’s inauguration to make a real difference in the way the administration would be allowed to run. For others, it meant a time to hold their ground against what was being called the “blue wave”. And for a large number of young people, the midterms marked their very first participation in a large-impact election. from New York’s 14th district. The results of the election turned out to be a massive leap forward for Democrats, who flipped dozens of seats and took control of the house — a significant change from across the board control Republicans have held since 2016. 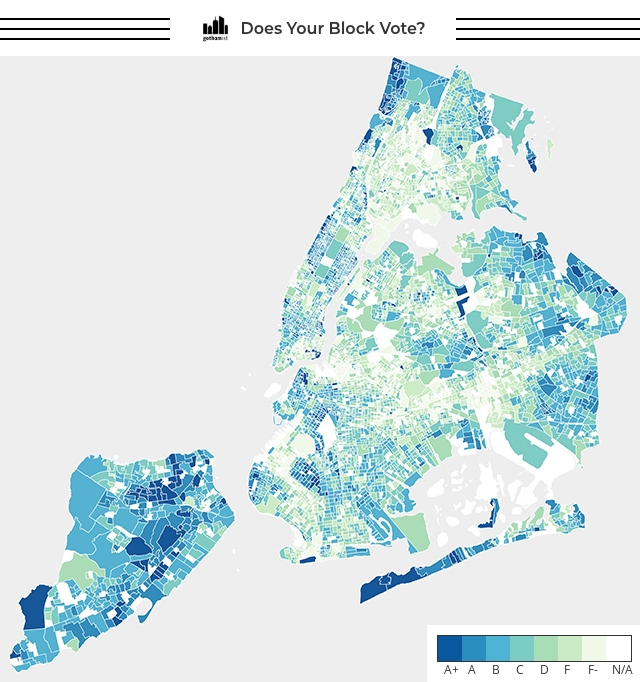 New York City, and New York State as a whole, has a notorious history of having consistently low voter turnout, which may seem surprising — New Yorkers love to talk politics, and they’re willing to kick people off subway cars for their bigoted views. In the last Presidential election, only 57% of eligible voters cast a ballot, and in the last midterm election only 34% statewide made their votes. New York is also one of the several states that does not allow for early voting, or same day registration. It’s as thoug they’re trying to make it difficult for us. A graphic from The Gothamist, illustrating the voter turnout for the 2018 midterm primaries – the better the letter grade, the higher the turnout. 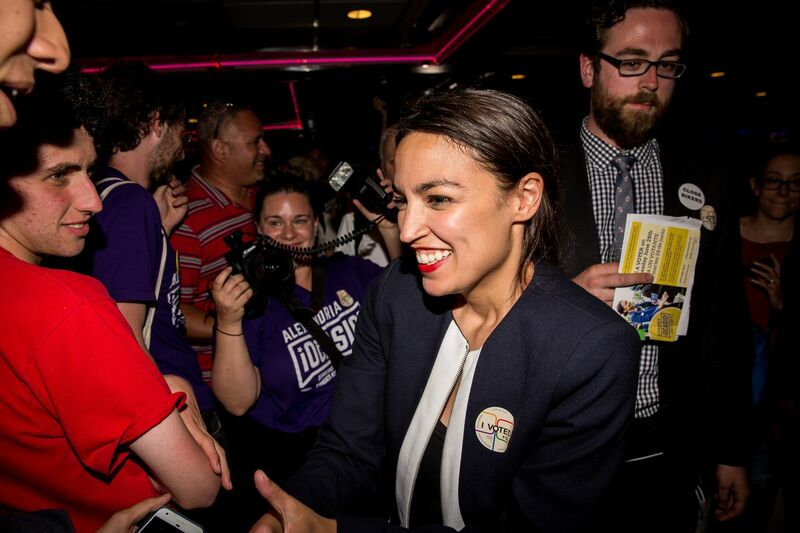 Clearly, New York City was all over the board — but the numbers for this year’s midterm election spiked dramatically. Though Andrew Cuomo was easily reelected, the voter turnout in New York State shot up to just over 45%. In the city, the turnout rose from 22% in 2014, to 38%. Nation wide, the trend continued, with 48% of eligible Americans voting. According to the New York Times, this is the first time the turnout has been so high since 1970. These numbers are still shockingly low, but certainly a step in the right direction. And, of course, it’s probable that this would not have been possible without the young people who spent the last year marching for gun violence prevention, women’s rights, and much more. The Flatbush/Midwood district of Brooklyn has been looking like a promising part of New York City to live in, That is — up until the last decade or so. From 1970 to 2000, the total population of the area was generally increasing, rising from just under 140,000 to just under 170,000 people. But from 200 to 2010, the total dropped almost 10,000 people. Some of this may be attributed to the recent gentrification movement that has hit many New York City neighborhoods over the last several years. Flatbush in particular has consistently been one of the most popular sections of Brooklyn to live in. According to the local community board (14) website, in the 1920’s apartment buildings began sprouting up which attracted many immigrants, leading the neighborhood to become remarkably diverse. II. What will your written story say? I was really interested in this topic after we had to do a post about it for class. I would like to do more research into how the young people of NYC (and probably the rest of NY state as well) voted in the midterms and what their thoughts were. Other students across the city? Other students across the state? V. What photos will you have? Dress your post up with interesting photos that are symmetrically arranged. The pictures should vary; and they should be yours or you should otherwise have the legal right to use them! maybe photos of the different candidates? VI. Who will be in your video post? Will it be video or an interesting series of photos? Will you do a voice-over in your own voice? Will you overlace it with audio of someone else you recorded? Will you use music? Perhaps search for the music now and try to have it ready on a drive, so that your job is easier when it comes time to put it all together. Don’t forget to credit anyone whose music you use, even when it’s from Creative Commons. Credit them at the end, in a credits text frame and/or in the body of your written post. I’d like it to mostly be student testimonial stuff, but doing some voiceover work could definitely be an option. We’ve managed to make it through two whole years of the Trump presidency. Congratulations to us. But aside from being the halfway marker, the first week in November meant something else or millions of people across America: the arrival of the midterm elections and the chance to finally be able to create change in the house and senate. And change did come. The democrats won big and managed to gain control of the house. This is first time Democrats have caused such an upheaval sine the 1974 elections ater Watergate. While Republicans still have the majority in the Senate, this is a considerable step in the right direction for anti-Trumpers. Perhaps the most important group of people who took to the polls on November 6th? The youth of America. Watch the video below to hear from just a couple young people who were eager to cast their votes. When I was in high school I used to think that being a photojournalist meant being this incredibly brave, fearless individual, who would rush into bomb sites and war zones, looking for that perfect photograph to send back overseas. Maybe my imagination was far too active, or I had seen too many movies, but regardless, listening to Ozier Muhammad speak about his career reminded me that in actuality, the life of a photojournalist is a humble one. “Always be prepared for an opportunity for a dynamic image”, he said to the class. And that’s all it really is, isn’t it? Muhammad has won numerous awards over the years and has worked at several big name publications, but at the end of the day, the most important thing to do as a photojournalist is to simply always be ready for that next brilliant moment to place itself in front of you. Naturally, taking photographs several decades ago meant carrying around film and developing it in a dark room. Nowadays, we can easily snap photos on our phones and digital cameras, but every photographer should still have basic knowledge of what makes up a good shot, just as every journalist should have basic knowledge of what makes up a good story. And of course, don’t ever leave the house without extra batteries. It’s fall at Brooklyn College! The leaves have changed colors, students are bundled up in jackets and scarves, but there’s one group of individuals who are busy preparing for the coming winter…. The famous Brooklyn College squirrels!